COLUMBUS, Ohio (AP) — Ohio State assistant Ryan Day earned an extra $487,000 for steering the Buckeyes during Urban Meyer’s suspension. That’s the amount of the lump-sum bonus the university will give Day for acting as head coach from Aug. 1 through last Sunday. Meyer served a three-game suspension for mismanagement of former assistant Zach Smith. Day was informed of the bonus in a letter dated Monday from athletic director Gene Smith. It will be paid Sept. 30. Day makes $1 million this year as co-offensive coordinator and quarterbacks coach. The No. 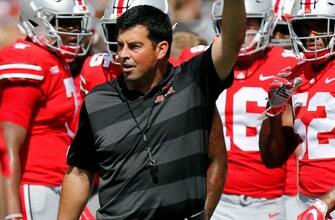 4 Buckeyes were 3-0 in the games Day coached, including Saturday’s 40-28 win over then-No. 15 TCU. Smith was accused of domestic violence and other behavior.